John Veale and Mike Webber (Optometrist Consultants, from Rose Charities New Zealand) went to Cambodia in mid-December, 2011. Their mission was to once again spend time at the Rose Charities Sight Centre in Phnom Penh with staff, training, ‘fine tuning’ and/or suggesting ways that could help in improving performance. The clinic now performs at a very high level of competence now in all areas of eyecare from surgery, medical ophthalmology and provision of spectacles after refraction, so the last six years of visits from the NZ team ( Dr. David Sabiston, John Veale and Mike Webber) , have proved very worthwhile. Another aim of the work this visit was to attend and help at one of he outreach clinics undertaken by Rose clinic and staff. This is a strategy started this year to coordinate with a new Governmnent program for the rural poor. Seven NGO’s have signed up for the program, with Fred Hollows and Rose Charities being the first two groups to start outreach clinics and provide cataract operations to those to whom they never would have been previously available. The target is to perform 50,000 cataract operations by the year 2018 in Cambodia. Rose Charities had planned for many years to commence rural clinics but in 2002 its vehicles and equipment were stolen by an crooked expatriate causing considerable delay to the program. Without this crime, The Rose Charities Sight Centre would by now have been able to assist many more poor Cambodians than the 100,000 it has assisted since 2002. Mike Webber and John Veale attended the first Rose outreach clinic in the Kandal province and about an hour and a half drive from Phnom Penh. There was an official opening ceremony filmed by Tv news, and a high ranking Governmental official from the Ministry of Economic Affairs, before they we got down to business of screening. They saw 253 patients, and of these about seventy were to be referred to the Rose Sight Centre for surgery for treatment at a later date. These patients were later transported down to Phnom Penh by truck (free), and taken home same way after treatment. Dr. 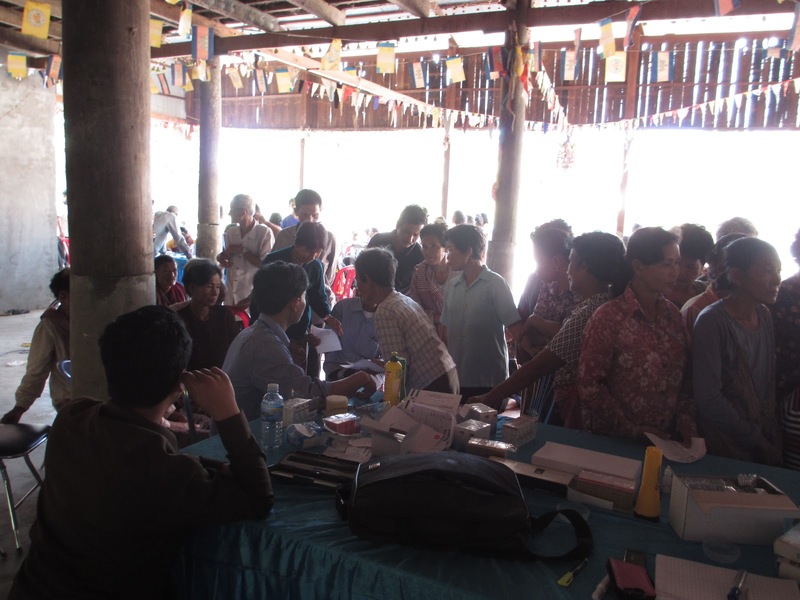 Hang Vra and his team conduct these outreach clinics once every two weeks at different locations in the provinces. The second outreach clinic saw 296 people and referred 125 referred to the Rose Charities Sight Centre for surgery. Third outreach clinic saw 100cases`referred for surgery. The surgery in all these cases was predominantly for cataracts. Mike Webber and John Veale also attended and helped at a program called Village Health And Community Development. This is a program run by Dr Veronica Ventura, an American gynecologist, who is based in Singapore. Both the Rose Charities Sight and Rehab/Surgical Centres cooperate with Village Health and Community Development programs where assistance can be given. Dr Ventura has four such projects going in Cambodia. Her method it to target a village off the beaten track in Cambodia and takes in teams of various medical specialties, including ophthalmic, and to survey the health and needs of these isolated people. 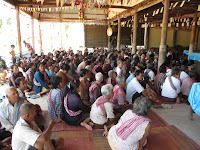 The program that John and Mike attended was in a village some one and a half hours drive from Kompong Thom, a town on the main road north to Siem Riep and geographically in the centre of Cambodia. be transported free to the Rose clinic by Village Health, and receive their surgery free under the Government program a the Rose Sight Center. The Government program is generously sponsored by ABC Tissue. It first began a long time ago, in May 2010, when plans for the construction of a safe therapeutic area for children and other patients with physical rehabilitative needs became a reality. Things shot off to a quick start with the construction of the roof and cement floor occuring within a month or so. In October, there was the Mural Project. Three vibrant young students with hearing impairments ventured to Takhmao from Epic Arts Kampot and worked with young people with disabilities here at the Centre to paint the amazing, bright wall mural that continues to capture the attention of all who enter the therapy area. Since then it has been slow and steady progress with more equipment gradually added to the floor area, and the wet season coming in and highlighting the need for small alterations to manage the water creeping in. This year was a particularly wet wet season, and we are really happy with how well the therapy area, given it’s open plan design, held up. Finally, the area became ready for the safe rubber flooring to be laid. Fortunately, we were successful in receiving funds from the Direct Aid Program (DAP) at the Australian Embassy, to implement a project finishing off our building establishment and purchasing resources for the education and training of hospital staff and the community in physiotherapy and disability awareness. 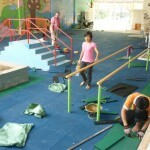 Funds were received on the 21st October 2011 and laying of the floor began on the 26th. After a bumpy start, change in glues, cars breaking down, challenging lumps in the cement floor, workers being away, long lunches, late starts and varying shades of floor squares, we now have a wonderful, large, safe area for providing therapy for children and adults. Money from a fundraising dinner held in Kadina, South Australia, Joanna’s (RCRC physiotherapist) hometown in early 2011, has been used to supplement the DAP funds to finish the floor area – we under-estimated the amount of rubber tiling required. These funds will also be used to tile the entrance, a cost not included in the grant proposal. The flooring area has already proven a hit with the kids! 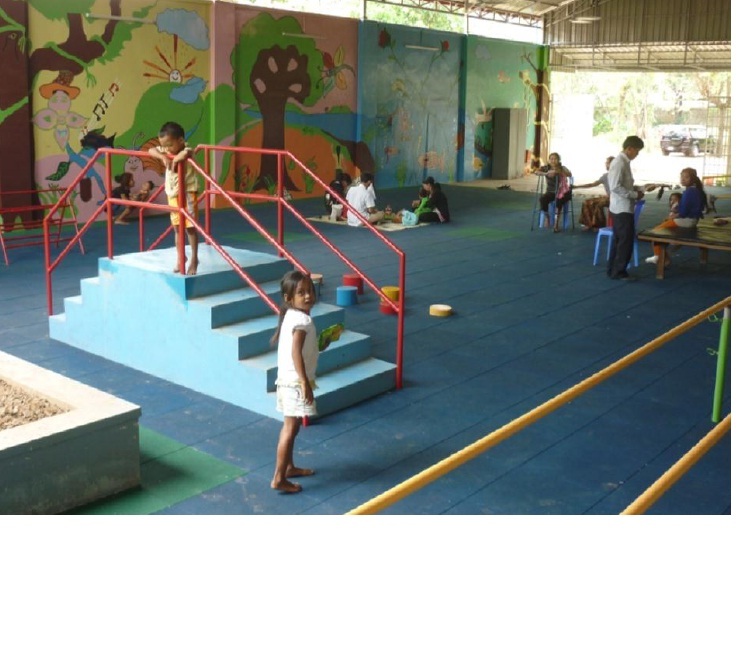 In true Cambodian collective group therapy style, children flock into the Centre when we open the gate (funded by Kadina dinner), just to run around and play on this new, strange, soft but firm, rubber flooring, spontaneously rolling around on the floor. Fantastic for disability awareness, children and adults have been joining in on therapy sessions and getting some insight into life for those with disabilities and how they can play and join in activities too. The flooring has created a safe environment for rehabilitation and therapy and has stimulated a great interest from the community and hospital in physiotherapy, disability and rehabilitation. We have been invited by hospital Director, Dr Kong Chhunly, to present to hospital staff again on physiotherapy and its benefits and encourage referrals and integration of physiotherapy into the hospital system. The development and progression of the physiotherapy area will continue – we are looking to build a storage room (we have no space for equipment such as standing frames, wheelchairs and other mobility/therapy aids), a waiting area, and will fix up the rough entrance. Many thanks to all donors, especially DAP (Australian Embassy) and the people of Kadina for these latest developments. 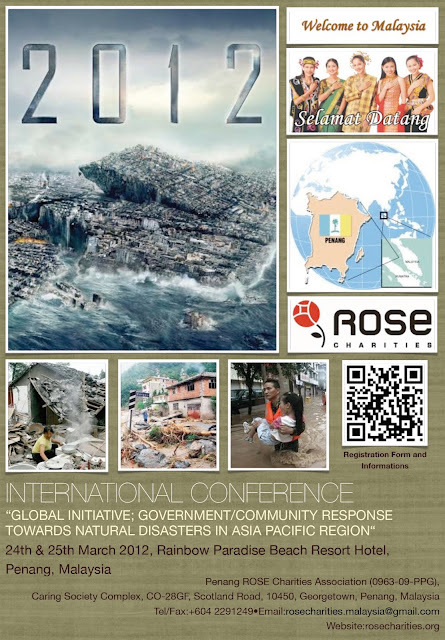 Rose Charities Singapore has established a transport link into Thailand. Through a network of volunteers, friends and affiliates, emergency supplies are being purchased in neigbouring countries and transported to the areas in need. Donations in the past 3 days alone have enabled us to purchase 1000 tins of milk power which will be sent to babies in evacuation centers through local Thai TV station ThaiTV3. We are now sending out the call for canned food for those stranded at the flooded sites. Donations are needed to assist program and will be very gratefully received. A big welcome to Rose Charities Singapore !! 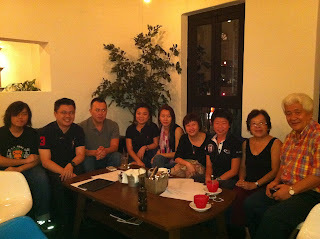 A Rose Charities Singapore has now been formed, assisted by Mr Lawrence Cheah and others. The whole Rose Charities network extends a warm welcome to our new organization ! Rose Charities Singapore has immediately sprung into action by helping raise funds for Baby Jeven who desperately needs a complex cardiac operation this October. 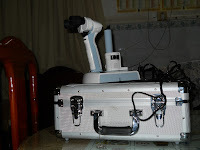 Rose Charities New Zealand had purchased a new ‘Keller’ portable slit lamp for Rose Charities Sight Centre, Cambodia. Mr Mike Webber (Wanganui, NZ) who has provided huge support of the Sight Centre over the years, both with his optometry expertise as well as material input and networking was instrumental in making the donation. 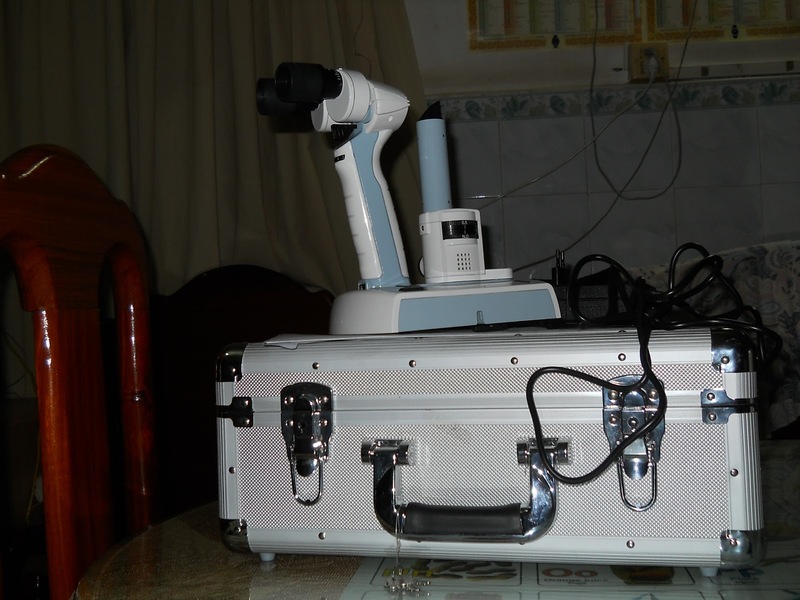 The slit lamp will upgrade the Sight Centres outreach services. “Access-for-All” – helping disabled women in Cambodia – a new program ! ‘Access-for-All” On Friday the 31st of July 2011, Joanna Thomson and her team at Rose Cambodia Rehabilitation Centre (RCRC) are excited to be attending the signing ceremony to receive a $20,000 (USD) grant from the Disability Inclusion Assistance Fund (DIAF). DIAF is a funding mechanism supported by the Australian Agency for International Development (AusAID) and managed by the Australian Red Cross (ARC). The goal of the DIAF is to reduce the vulnerability of persons with disability including landmine and explosive remnants of war (ERW) survivors, their families and affected communities in Cambodia. The grant will be used to support the “Access For All” project which aims to address the issue of women with disabilities in rural areas being unable to access secondary and tertiary education. The project provides a safe, secure housing solution for disabled women, allowing them to move into the town and live independent, fulfilling lives where they can access educational opportunities. Not only are the beneficiaries able to access formal education but they are also trained in project management and organisational development skills which will enable them to be leaders and manage the project independently long-term. Through the learning of life skills, taught to them in the supportive home, they will be able to gain confidence and learn to participate fully in the community and to teach others about women with disability and raise awareness and advocate for disability rights. Through the long-term acquisition of skills and formal qualifications they will be able to earn an income and relieve the burden on their families of caring for a disabled daughter in rural Cambodia, increasing the living standards of not only themselves, but their whole family. This project has been established by inspirational local Khmer man, Mr Ull Meng Hour. Located in Prey Veng Town, this project has been developed by a group of devoted local volunteers with Mr Hour’s leadership. While Jo Thomson is the Project Manager for this project, her role will largely be a consultative and advisory role as the day to day management of the project will be staffed by the women with disabilities who are the beneficiaries of the project. Mr Hour and his supporters will remain very much involved in the project acting as long-term project guardians who will provide training to the project team and will ensure that the project is being implemented in line with the identified objectives. While this grant covers the basic costs of the project for the next year, more funds will be required to sponsor the beneficiaries’ educational requirements, in particular their University fees. As well, more laptops are required. I loved my medical elective at Rose Rehabilitation/Rose eye clinic in Cambodia! I sit in clinics now wondering what I would be doing if I was still out there and reminiscing about this unique experience. Cambodia as a country is amazing, it is full of the friendliest people I think I’ve ever met; everybody is keen to help you and make you feel welcome. This was no different at Rose Rehabilitation centre in Takhmao. It was a slightly awkward moto journey arriving there from Phnom Penh (capital city) but all the angst quickly disappeared once I saw Joanna, Sophak, Rith and the rest of the team. They were extremely welcoming, friendly and inclusive; even when there were no medical issues for me to be getting on with – Joanna always invited me to visit the rehab patients in the community to take histories, examine them etc and even teach me. She (and the rest of the team) answered my questions; always allowing time for me. It was truly extraordinary to see the healthcare running successfully with limited resources and the variety of patients that Rose Rehabilitation deal with; the immense clinical signs really tested my (limited!) medical knowledge and allowed me to see the aftercare involved in a surgical patient – something I rarely see in hospitals back at home. This was such a great opportunity to really test my clinical skills too and offer some medical tips back to the team. I have to stress though that this is not always the case for visiting medical students – it just so happened that my visit coincided with Dr. Sarom’s (the head surgeon) visit to Australia and so I was only able to spend about a week with him. I had applied for this elective because I am highly interested in surgery and did get to see some cool cleft palate repairs, plastics and grafts but never got a chance to assist unfortunately as I believe Dr. Sarom was training a Khmer doctor at that time. It was lucky for me that I have a keen interest in ophthalmology and so I split my time between takhmao (Rose Rehabilitation) and the eye clinic (based in Phnom penh) where I sat in the clinics for the morning and then assisted – that’s right – ASSISTED in ophthalmology surgery in the afternoons! The eye centre is run by Dr. Vra (who predominantly performs cataract surgery) and his Ukrainian wife – Dr. Natalie (oculoplasty etc) – the rest of the team are lovely however, language is a major problem. If, by chance, you speak Russian or Khmer – then great! You will be fine – but if however, you only speak English – it makes life somewhat interesting…. Of course you pick up little things here and there but you can’t really run the clinic or ask the patients much yourself – without a translator. I was lucky that Dr. Natalie was so keen to teach and wrote everything in English. She was also very eager for me to practise my surgical skills and although I’m sure I was the local attraction/entertainment at the clinic – her teaching was invaluable. The very first day there, she made me do an interrupted suture with tiny thread on a blepharoplasty . It soon progressed to me doing complete operations on my own – supervised of course. If you’re keen or even interested in ophthalmological surgery – this is the place to be, there is nowhere in England that you will get such experience at our level – it is impossible so I am truly grateful for the opportunity I had to complete my elective here. However, if you are squeamish, then I suggest maybe just attending morning clinic (start at 8am-12pm) as all the patients are under local anaesthetic only for their surgeries! – Bring your own scrubs especially for eye clinic and id suggest taking your own crocs too but they all wear flip flops. – If you can get sterile hats then bring them too. – I’d suggest staying in Phnom Penh – purely as there’s so much more to do there, and it really caters for westerners. I stayed in Europe Guesthouse on Street 136, which had the perfect location and was run by the loveliest family! – Take a book with you to read if you’re spending time in Takhmao as everything runs on “Cambodian Standard Timing” and you do end up waiting around for patients etc. There is a medical ward there but the doctors speak only Khmer or French. Dr. Sarom is excellent and speaks good English however. – Getting to Takhmao – if you can arrange for the directions to be written in Khmer and find yourself a nice tuk tuk driver that will do you a deal – take it! I went with a friend of mine (Physio volunteer) from Phnom Penh via tuk tuk there and back and it came to $7 a day but I’m sure it can be done cheaper. – At the eye clinic – there is a nice canteen around the back where doctors and other volunteers from the opposite surgical centre eat – lovely dinner ladies and you can eat as much as you want for 2000 riel – that equates to around 25p! – Definitely try sugar cane juice when the lady comes around on her moto too. – Uniform – it’s so hot (esp. during march-may) that I wore cropped trousers, shorts, and decent tops – there’s no need in dressing too smart as everybody is pretty laid back. – Be prepared for things to “go with the flow” – it is not a regimented elective – which I think is good as it really allows you to immerse yourself in Cambodian nature. – Ooh if you’re vegetarian – learn the words in Khmer for “no meat, no fish” etc and just re-iterate that when you go to eat. I found it difficult to find vegetarian food – esp. in Takhmao but it’s understandable as it’s not in Cambodian nature to not eat meat! However, Sophak, Sokney and Joanna all made sure the dinner ladies at Takhmao had some vegetables for me; they really look after you during your elective so just remember to have fun!